A quick and easy salad made with ready-cooked chicken and a taco-seasoned dressing. 1. Mix the dressing ingredients in a small bowl. 2. Combine the lettuce, tomatoes and half the cheese in a large bowl. Add most of the dressing and toss well to coat. 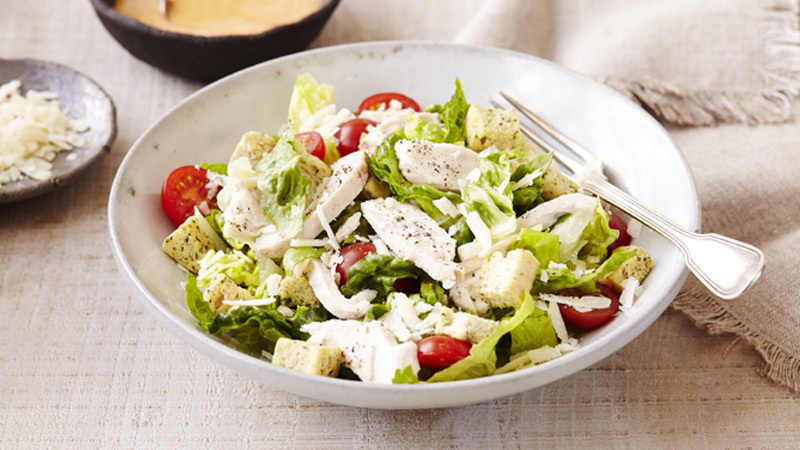 Divide the lettuce mixture evenly between 4 individual salad bowls and top with the croutons and chicken. 3. Scatter over the rest of the Parmesan cheese and drizzle with the rest of the dressing. Season with plenty of freshly ground black pepper. Add some drained and finely chopped anchovies to give the salad an extra piquant flavour. Toss the salad in the dressing just before serving otherwise it will go limp.